There are many unsung visionaries out there in the motorcycle world who've created environments and mediums for us to express our creativeness with bike builds, photography, and more. One of those guys is Michael Arnold. 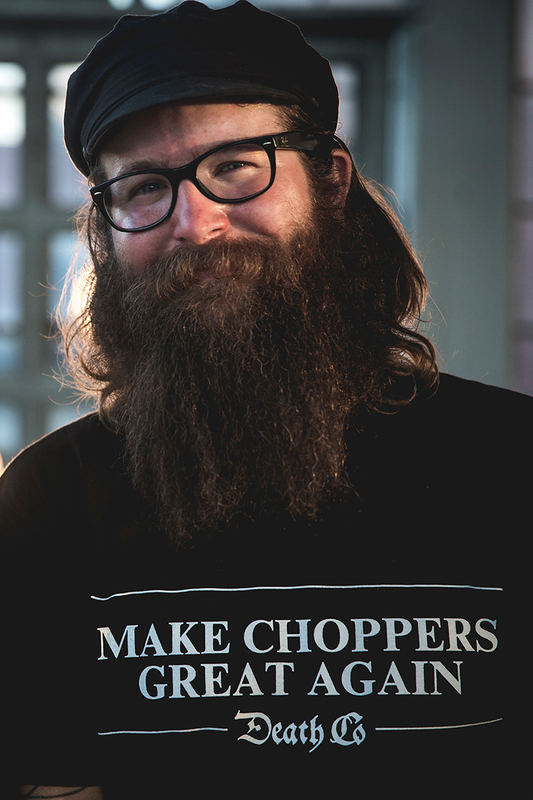 I recently got to ask Mikey all about how Fuel Cleveland, one of the fastest growing motorcycle shows, came to be and his answer was simple "we just did it". He's not just going through the motions, he's truly invested in highlighting talented people around the world in the motorcycle community. One of Mikey's missions is to get more ladies involved in the show so if you are a photography, artist, builder, etc. We urge you to reach out to Mikey at the Fuel Cleveland show and submit your portfolio for 2018's event in July. Some of our ladies have been featured in this incredible show and we can't wait to see more next year. Read on and get to know Mikey Revolt aka Forever The Chaos Life Life aka Lowbrow Customs videographer aka the guy who said "what if" and made it happen. A rare photo of Mikey! When I was really young, say around 3 or 4, I remember sitting down on my grandma’s piano and playing melodies off the top of my head. My mom would look at me like I was a genius or something. I think that was the beginning of my creativity bug. As I got older, I experimented with drawing, painting and playing music in bands for most of my teen’s and mid 20’s. I was always shooting skateboarding with a point and shoot camera, but it never gave me any indication of what I am doing today nor the countless hours of video taping everything I saw in high school when it came to skateboarding and friends partying. It’s kind of weird to think about now that I look back at it and where I am today. I also got into trouble a lot but not with the law, mostly just in school and at home for being too smart for my own good. For some reason, I’ve never liked people telling me what to do and if someone said I couldn’t do what I wanted, I would make it a point to prove them wrong. In 2009, my mother passed away at the age of 42, she died way too young and only being 25 at the time and her only child, it devastated me. I lost my ways for a little while that year but I’m thankful I found my wife’s DSLR camera collecting dust. The day I picked up that camera was the day I never looked back at falling into that black hole of devastation that I was in. Still to this day, I’m learning new and exciting things about my camera and how to use it to convey my visions. That camera has also opened up so many doors for me over the years and I’m truly grateful for it. I’m not sure that I’ve completely found my life’s calling, but the path I’m on right now is going pretty well. I’m never content with settling with just one thing, I have to keep pushing myself to be the best, challenge myself and create more. My life has been a book full of different chapters, I’ve constantly been adapting and changing. I feel like this isn’t my end chapter yet, but I do feel it’s been a pretty wild and crazy ride so far. How has your job/lifestyle in the motorcycle world changed your life? For me, it has been the friendships I have made over the years. Working in the motorcycle industry along with just riding a motorcycle in general, has introduced me to so many amazing people all over the country and world. I probably would have never met most of them otherwise. The stories, the lives, the passion that comes from the motorcycle community is something you can’t explain in an interview like this, it’s something you have to experience over time. There’s just so much genuineness in this lifestyle and it really has restored my faith in humanity over the years. I think the day I got back from NYC, I started working on the show while having to go back to work at my crappy cell phone sales gig. (yes, I used to be one of those guys… ugh) The name Fuel Cleveland came maybe a week after the idea was conceived. We then thought up the main concepts and ideas behind the show. One of the main ideas was to have a place where we could celebrate the culture, community and craftsmanship of motorcycles. We also wanted to have a show that didn’t follow the same formula as so many other shows. Making a list of things we disliked and steering far away from those. And, the most important idea of them all was finding a way to keep the show 100% FREE for everyone to attend each and every year. We now have 3 shows under our belt, and we have kept true to everything we set standards for in the beginning and it keeps getting bigger and better each and every year. The first show, we had around 30 bikes and 30 artists work on display. It was in a small warehouse on the East Side of Cleveland. Around 800 to 1,000 people showed up throughout the day and for a first-year show, we couldn’t believe the turn out. The second year, we had the show at Rays MTB Mountain bike park, which proved you could put a show on anywhere. We added another 20 bikes putting the total at 50 bikes on display and still about the same number of artists. The layout was a bit chaotic at that location and some people didn’t get to see every bike in the show. Still numbers the attendance grew­—I think we had over 2,000 in attendance, if not more. The first two shows were held in May and we found the weather to be so finicky in Cleveland around that time, so we decided to move the show to the end of July. Being in May, we also found complications in getting some builders to come out because we were competing with a few bigger shows around that time. I feel like this was the best move for us having the show in July. We had over 85 bikes in this year’s show. I’ve kept the same amount of artist each year but we added a new element to the mix, where painters could bring multiple pieces of work that weren’t just a painted gas tank or helmet. We also had changed to another new venue this year. A humungous warehouse on East Side owned by the Ingenuity Festival (a huge art festival held once a year in Cleveland). This new location made for an exciting and jaw dropping setting for the show. We set a record number of attendance this year too, estimating it at about 4,500-5,000 people. The overall response to this year’s event was resounding positive vibes from everyone. With that in mind, we decided to keep the same venue for Fuel Cleveland’s 2018 show. We will continue to dial in the logistics of the show and make it even easier for people to enjoy. 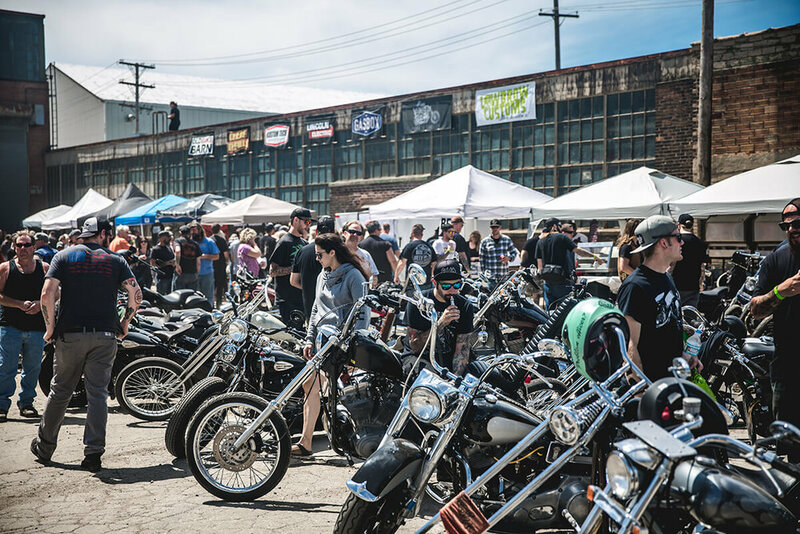 We will still be bringing a wide variety of vintage and rare bikes along with off-the-wall builds and talent from all over the world to showcase again next year. I’m thinking about maybe having a classic / hotrod parking area outside, a few more food vendors, etc. All the ideas are just in my head right now and nothing is set in stone. 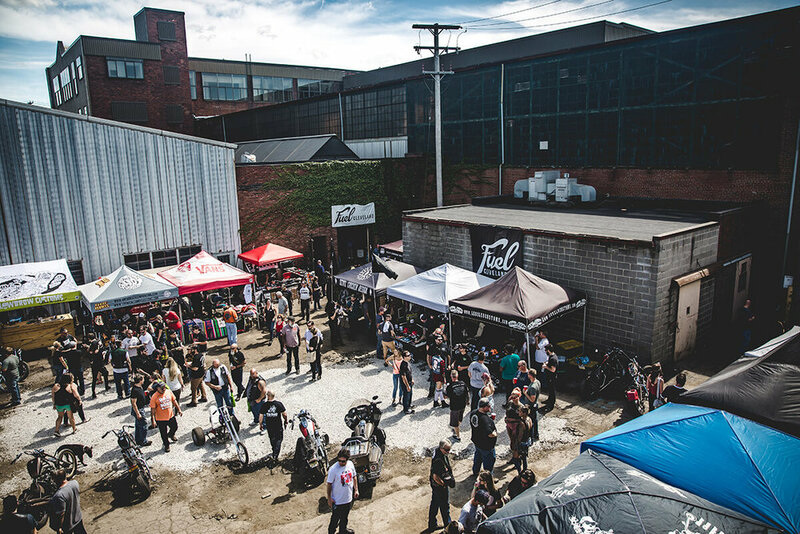 We just want to make a destination where people can spend an entire day at Fuel Cleveland, enjoy themselves, learn about the culture and go home inspired to build something, create something, or ride something of their own. Over the years of doing this show, I’ve also focused on inviting inspiring female artists and builders. I’m a huge advocate when it comes to equality. Even in this decreasingly male-dominated motorcycle culture, I still feel it’s unjust to so many women who are killing it out there­—talented women get over looked each and every day just because they are a female. This year, we featured photography from Josie Perez, Virginia Cagney, Meredith Devine, and Genevieve Davis as well as Gabriele Stauss' Ironhead Sportster and Jen Hallet’s painted tank. Though the numbers aren’t where I’d like them to be in the show, I hope I can continue to grow the amount of featured female artists and builders/owners in future shows. Every day is a learning curve with planning an event. I don’t ever really get put off guard by anything but I do find it crazy that with months and months of planning, it all really still falls on the people you invite. You can do everything you possibly can to make sure you stay in contact with those that are going to showcase and or bring a bike to the show and you will still have some that back out last second for good reasons and others with reasons that are suspect. I’ve learned to brush it off and not take offense to any of it though. It’s easier to just be understanding and move on, it’s all you can do. If you sweat the small stuff it makes the rest of your day/event just that much harder. What are you “work” looking forward to for 2018? What are you personally looking forward to in 2018? I’m not sure…I try and live day to day and not expect too much with the future. I’ve learned over the years if you put in hard work and try your best at what you are doing, the outcome will always be a reward no matter what. If you are always looking forward you are missing the things that are happening right in front of you. One thing my camera has taught me over the years is to be more observant of not only my surroundings but of what is going on right in front of me and enjoying those moments. Capturing them is one thing but living in the moment and keeping those experiences fresh in your mind and learning about life is so much more important to me. I will say that I hope we can make Fuel Cleveland 2018 live up to the fun and amazing vibes this past show had. I promise we will continue to bring exciting and interesting builds, artists and photographers. Visit www.fuelcleveland.com for more info.